A seismic investigation of the influence of upper-mantle structure and dynamics on faulting, extension, and rifting in the Sea of Cortez (Gulf of California), Mexico. 14 OBS were recovered in Oct 2006. Hundreds of local, regional, and teleseismic earthquakes were recorded. Analyses are underway, check here for updates. Deployment of a wide-band OBS in the Gulf of California from the R/V New Horizon in Oct 2005. Seismometer is housed in the green sphere, while recording, power, and communications devices are enclosed in the black cylindrical pressure cases. Instrument sinks to seafloor (1-3 km depth) due to its own weight. After recording for 1 year, the anchor (bottom plate) is released, and instrument returns to surface, driven by buoyancy of glass spheres housed in the yellow cases. 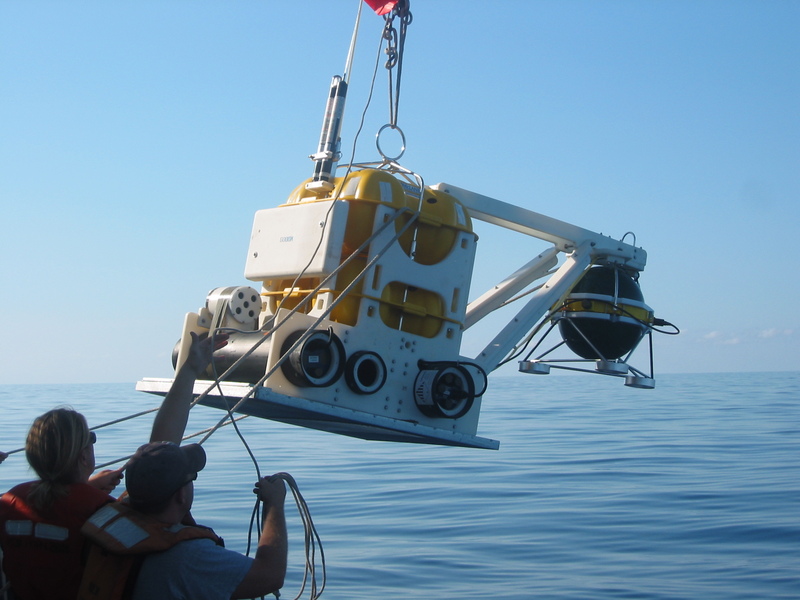 Instrumentation was provided by the Scripps Institute of Oceanography's OBS facility, as part of the US National Ocean Bottom Seismograph Instrument Pool (OBSIP). Underway data and other experiment information is archived in the Marine Geoscience Data System, under the expedition name SCOOBA1NH. OBS data will be archived in the IRIS Data Management Center and will be openly available in October, 2009. Funding for this experiment was provided by the US National Science Foundation, through the MARGINS program. Return to Jim Gaherty's home page. Return to LDEO main page.